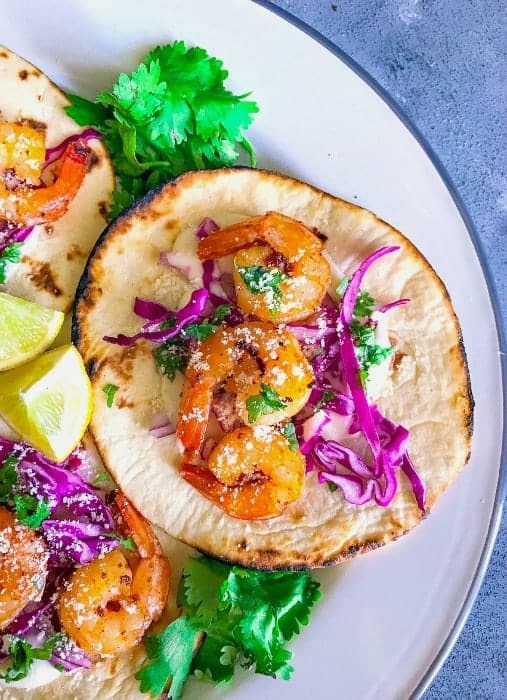 Caribbean Jerk Shrimp Taco with Plum Salsa: every bite of this spicy-sweet taco would make you want to do a happy dance. Filled with Caribbean flavors, these taco’s are super easy to make and an absolute party favorite recipe. The coming weekend we have a fun cookout party at one of our friend’s place and I’m taking these Caribbean Jerk Shrimp Taco with Plum Salsa as my contribution. 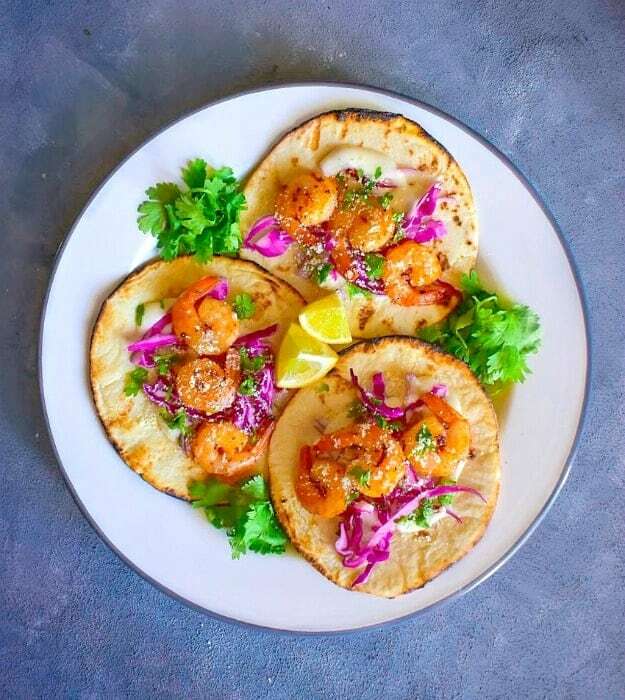 I’ve made these ‘Jerk Shrimp Taco’s’ a bazillion time (read -> many times) as it’s one of my favorite goto recipes for a large party as first, they taste amazing and secondly, they are made in no-time – So, a total Win-Win for everyone! The only cooking involved is ‘simply cooking the shrimp’, rest is all about the garnish or toppings. 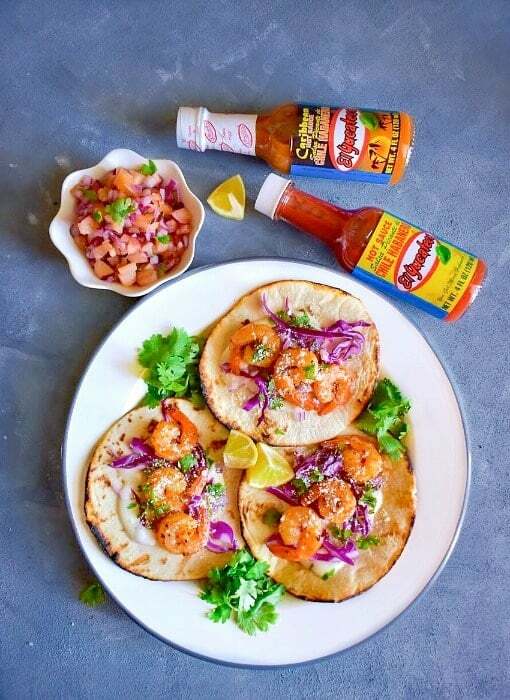 My secret ingredient in these absolutely scrumptious tacos is El Yucateco® Red Chile Habanero sauce! This is one of my goto ingredients when I want my recipe packed with flavors – a little amount (2tbsp) and you get this amazingly flavorful dish with minimal effort! (Who doesn’t love that). 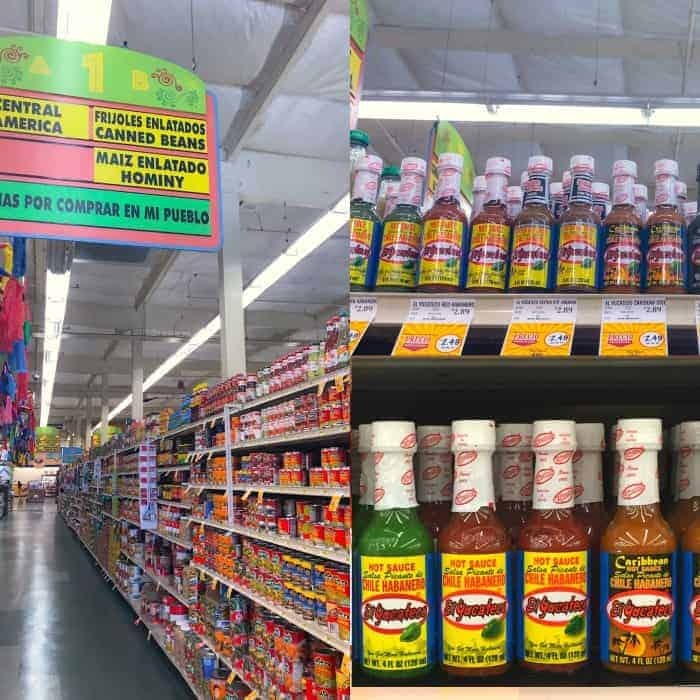 I buy these El Yucateco® sauces from a local Hispanic Retailers and Latino Market called ‘Mi-Pueblo’ and they carry a large variety of these sauces. 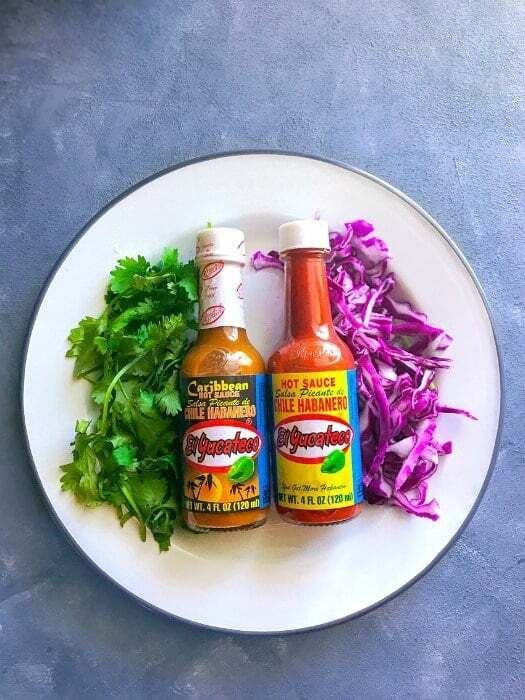 So, as this party was approaching, I quickly picked up the El Yucateco® Red Chile Habanero and also came across a new flavor (for me) and that is the El Yucateco® Caribbean Habanero. If you remember, I have used these El Yucateco® sauces in my previous recipes like this 3 Meat Spicy French Bread Pizza or this Michelada recipe. I’m really excited to add the same delicious and natural flavors to my Caribbean Jerk Shrimp Tacos. “El Yucateco®’s ingredients come from Field to Bottle, it includes no artificial colors, but the same great taste that makes it the King of Flavor since 1968”. Now, that’s the reason why I love using it is all their sauces contain peppers grown in their own field. 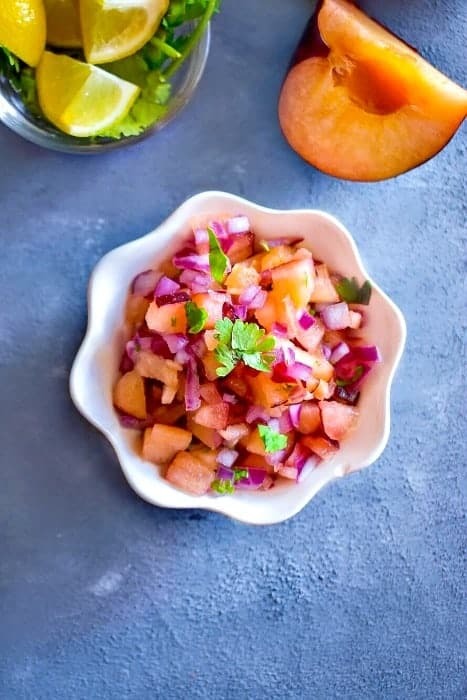 Since the sauce adds such amazing flavor with a slight kick of heat, I decided to top the tacos with a quick Plum Salsa which is so refreshing with the seasonal plums in the market. So, you can say, this entire dish is a perfect mix of sweet-spicy and deliciousness (you can also add convenience and budget too)! I usually make the salsa first and keep it in an airtight container in the fridge. There’s this big tip that I learned from my mom whenever we make salsa or chopped salad, we never add salt until it’s ready to be served. This prevents the salad/salsa from becoming all mushy (as veggies don’t leave the water until salt is added). 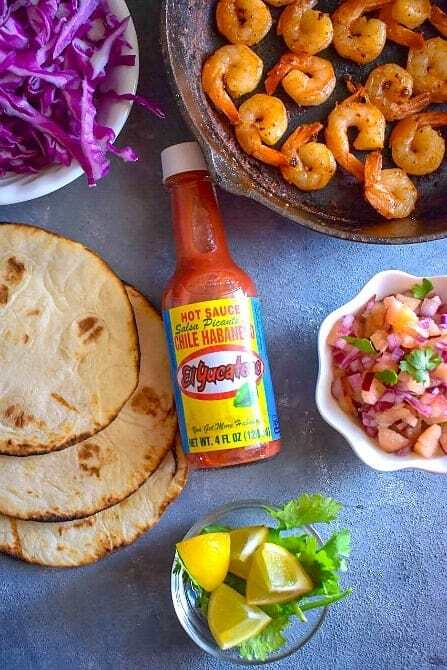 Once the salsa is all ready and packed, it’s time to quickly cook the shrimp using the hot sauce and Caribbean seasoning (homemade or store-bought). That’s it, once the shrimp is cooked, it’s just assembling the tacos. Now, there’s this little extra step that I do to add that extra ‘yum’ factor to our tacos, that is to slightly char/grill the tacos over open flames/gas or even grill. Simply heat them a little till you see charred marks and you are good to go. Also, I do carry this hot sauce bottle many a time in party or trips for that extra touch of flavor..trust me, the bottle is so sleek and slender, it fits any of our bags. That’s it, this was such an easy recipe, that once you try it, you’d want to make them in any given party. Although I’m making it for a cookout, it’s perfect for camping, hiking or even tailgating. 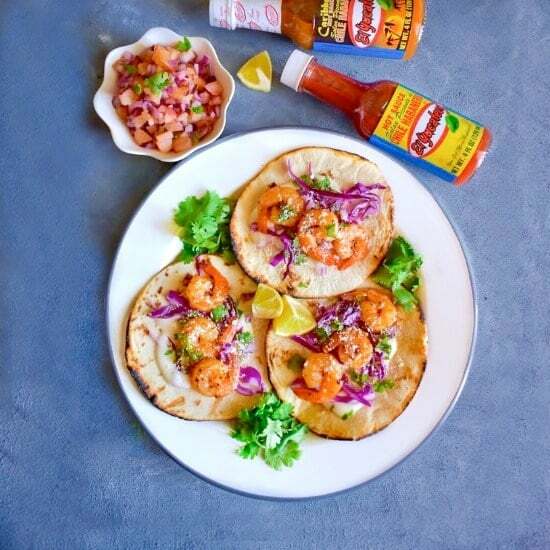 Just pack the cooked shrimp separately and assemble the taco’s when you’re ready. 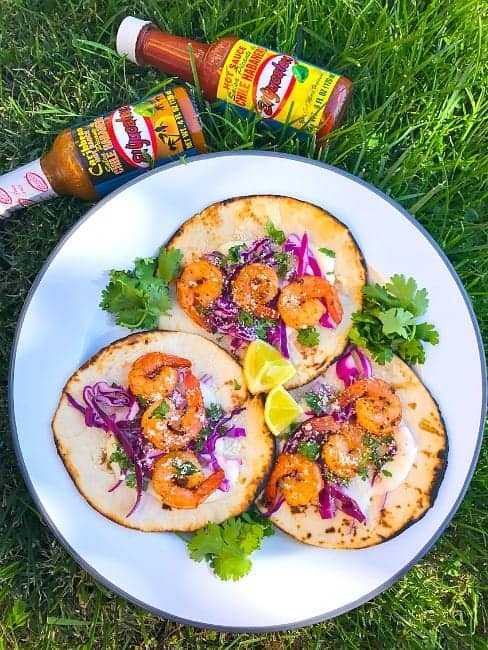 So, go ahead and make this delicious Caribbean Jerk Shrimp Taco with Plum Salsa for your next party and surprise your loved ones with delicious flavors. 10-12 Medium Cooked Tortilla - you may use any tortilla of choice. 1.5 Cups Shredded Red Cabbage - you may use green cabbage too. In a large bowl, mix the plum salsa ingredients together. Keep in serving bowl and refrigerate until tacos are ready to be served. Add shrimp and saute for 2-3 minutes (till shrimp begins to cook). Now add 'El Yucateco® Red Chile Habanero' sauce and Caribbean seasoning. Saute everything together and let it cook over medium heat for 4-5 minutes. (keep sauteing every minute to prevent seasoning from burning). Once the shrimp is cooked, remove it from the gas. You can use a small grill stand or if you have grill on gas, then use that directly. Simply, keep the tortilla over the gas and heat them on both side. Keep heating till you see some charred edges. Place the charred tortilla on serving plate. Spread 1/2 tsp sour cream on top and place 1 tbsp red cabbage. Now, add the shrimp on top and add chopped cilantro. Add plum salsa on the tacos. Finally sprinkle cheese on top. Squeeze lime juice over each taco and serve immediately. 1 Reply to "Caribbean Jerk Shrimp Taco with Plum Salsa"